One of the earliest symptoms that appeared before my MS diagnosis was imbalance. I remember turning my head to look at something and feeling slightly off-balance. I didn’t think much of it at the time, but that wobbly sensation gradually increased through the years. Occasionally, I would bump into walls and nearly fall, appearing drunk, and clumsy. I knew something was off, but I wasn’t sure what was causing my balance problems. According to the article, our brains have difficulty relaying the information they receive when MS is present. The connection can be faulty due to the damage caused by MS. Therefore, it affects how the brain shares information and causes imbalance. 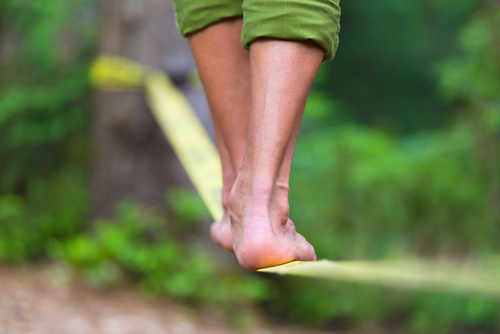 Vision, and inner ear and sensory issues in MS are some of the problems that can affect your balance. However, balance issues can also be caused by vertigo, inner ear infections, or something else unrelated to MS, which is why it is important to speak to your doctor if you notice any changes in your balance. The Multiple Sclerosis Society U.K. suggests making an appointment with a physiotherapist, occupational therapist, or an MS nurse to help with MS-related balance issues. Anyone of them can help set up an exercise routine to help improve posture and strengthen your muscles to make them more supple. Yoga, Pilates, and tai chi are some other strengthening and stretching exercise options. Also mentioned were common techniques to help improve imbalance such as vestibular exercises and compensation techniques. Vestibular exercises use brief moments of loss of balance in order to teach you how to regain it. Be sure to speak to your doctor before attempting these types of exercises. Fatigue or spasticity also can impact balance, so it is best to try to manage those issues by talking to your doctor to find some more helpful options. By strengthening your muscles and core and becoming more flexible, you will have a better chance of tipping the scales in your favor and improving your balance.